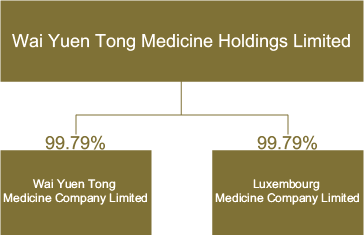 Wai Yuen Tong Medicine Company was founded in 1897 with a long-established Chinese pharmacy history under the brand name of "Wai Yuen Tong". It is engaged in the manufacturing, processing and retailing of the traditional Chinese medicine and is prominent for its excellence in pharmacy using the ancient formula. The presence of the internationally recognized pharmaceuticals including “Fuzheng Young Yum Pills”, “Bird’s Nest Pak Fung Pills”, “Hou Tsao Powder” and “Po Ying Dan” renewable products. It has extended its product sales to South East Asia, Europe and the United States, which are popular to overseas consumers. Luxembourg Medicine Company was founded in 1954, and has become a brand of global renown with its uniquely formulated and highly effective Madame Pearl’s (MP) Cough Syrup and Madame Pearl’s Cough Syrup for Children. The company has in recent years developed different types of medications and healthcare products, including the new MP range of professional medicines, which was launched in 2007, and the new brand Pearl’s, which was debuted in 2009. MP focuses on products targeting the upper respiratory tract, while Pearl’s area is in personal and family care products. These product lines, characterized by innovation and functionality, provide the family with safe and effective new solutions for a quality life.